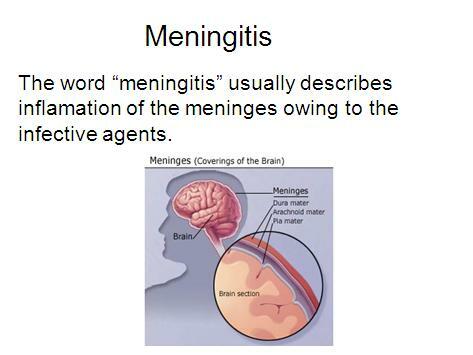 Meningitis is a bacterial infection of the membranes covering the brain and spinal cord (meninges). 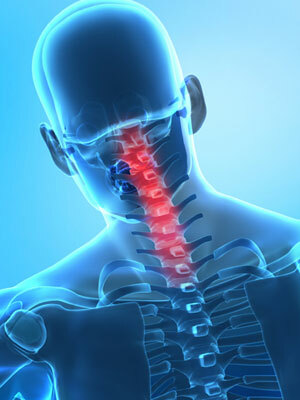 It is the inflammation of the lining around the brain and spinal cord. They can become inflamed when an infection occurs in the cerebrospinal fluid (CSF) surrounding these membranes. Other things such as medications, tumours, and chemical exposure can also cause meningitis. Bacterial Meningitis is usually severe, although most people with meningitis recover, it can cause serious complications, such as brain damage, hearing loss, or learning disabilities. 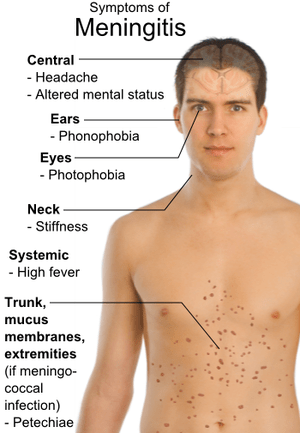 There are several pathogens (types of germs) that can cause bacterial meningitis. Some of the leading causes of bacterial meningitis include Haemophilus influenzae (most often caused by type b, Hib), Streptococcus pneumoniae, group B Streptococcus, Listeria monocytogenes, and Neisseria meningitidis. Fungal Meningitis is rare, but can be life threatening. 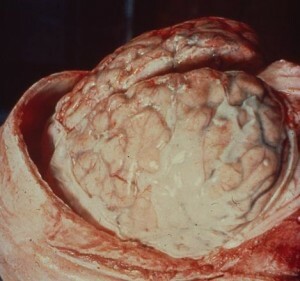 Although anyone can get fungal meningitis, people at higher risk include those who have AIDS, leukemia, or other forms of immunodeficiency (an immune system that does not respond adequately to infections) and immunosuppression (immune system malfunction as a result of medical treatment). The most common cause of fungal meningitis for people with immune system deficiencies, like HIV, is Cryptococcus. Primary Amebic Meningoencephalitis (PAM) is a very rare form of parasitic meningitis that causes a fatal brain infection. The parasite enters the body through the nose and is caused by the microscopic ameba (a single-celled living organism) Naegleria fowleri. Non–Infectious Meningitis is caused by Cancers, Systemic Lupus Erythematosus (Lupus), Certain Drugs, Head Injury and Brain Surgery. This type of meningitis is not spread from person to person. In bacterial meningitis, symptoms can develop rapidly, often within hours. The symptoms of viral meningitis may take a couple of days to develop. The infection that causes bacterial meningitis is treated with a combination of antibiotics. The antibiotics you receive will depend on the bacteria that are suspected, your age, and other factors. The antibiotics are injected into a vein. You might have to receive the antibiotics for as long as 3 weeks. For the first few days of antibiotic treatment, you may also be given dexamethasone* (a corticosteroid) to help reduce the risk of meningitis complications. People with meningitis, regardless of the cause, may need supportive treatment such as intravenous fluids and fever-reducing medications. Meningitis Vaccine. Haemophilus vaccine (HiB vaccine) in kids will help check one category of meningitis. The pneumococcal conjugate vaccine is now a regular infancy immunization program and is very helpful at preventing pneumococcal meningitis. Household members and others in close contact with people who have meningococcal meningitis should get defensive antibiotics to stay away from becoming infected themselves.